Do you have any Welsh convicts in your tree? Did Jane Austen fake marriage records? Whenever possible links are included to the websites or articles mentioned in the newsletter (they are highlighted in blue or purple and underlined, so you can't miss them). If one of the links doesn't work this normally indicates that you're using adblocking software - you need to make the LostCousins site an exception (or else use a different browser, such as Chrome). To go to the main LostCousins website click the logo at the top of this newsletter. If you're not already a member, do join - it's FREE, and you'll get an email to alert you whenever there's a new edition of this newsletter available! Note the Enumeration District letter code at the top left - ENFT. This formed the first part of the Identity Card number for every person in that district, and comprised a three letter code (ENF) for the borough or district, in this case Horsham, followed by a single letter (T) identifying the specific enumeration district. This isn't, of course, the Identity Card she was issued with in 1939 - it has her married name, and her new address, But the number of the card is exactly the same, because that's how the system worked. 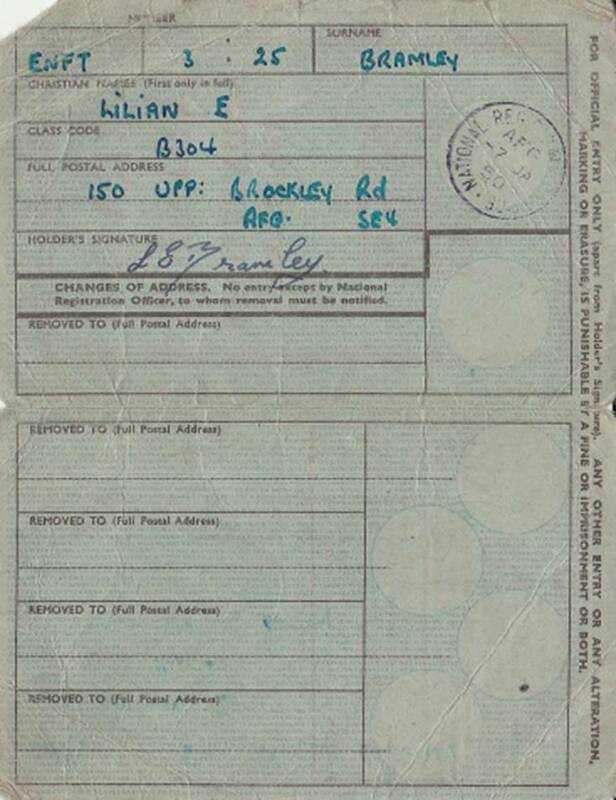 If you go back to the 1939 Register entry you'll see that it shows the date in 1950 that the register was updated, probably 1/3/1950, and also a three letter code AFG, which also appears on the Identity Card. This is the three letter for Deptford, the borough to which she had moved. Tip: you'll find a table of boroughs and their three letter codes here (although it isn’t complete). When the National Health Service launched in 1948 it was natural to use the same numbers to identify patients, and although identity cards were abolished in 1951 (the circumstances are described in this BBC News article), the National Register was repurposed as the NHS Central Register until it was eventually computerised in the decade up to 1991. 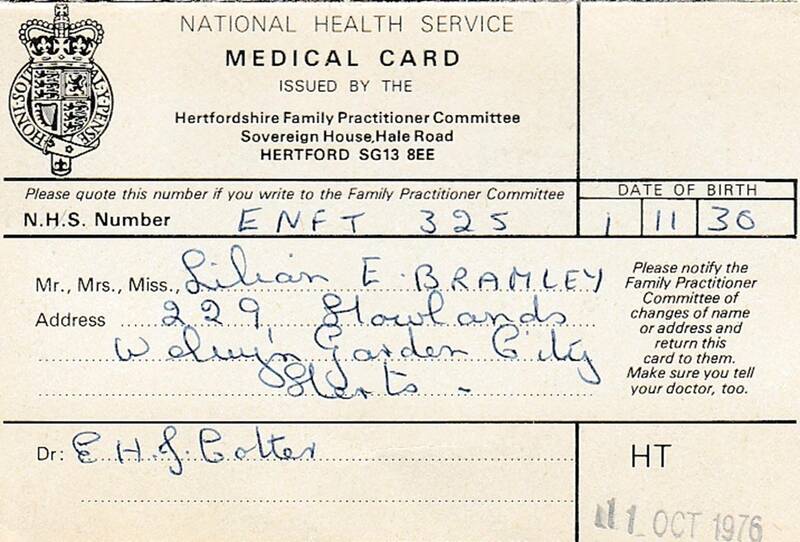 And, as you can see from the Medical Card below, which was issued in 1976, Mrs Bramley still had the same number, with its Horsham borough code, even though she had by now relocated to Hertfordshire. In the second part of this article - in the next edition - I'll be looking at another example of how Identity Card numbers were used, both during and after the war. Note: something that won't be apparent from the register page is that the maiden name of Margery Holman, the lady of the household where Lilian was staying, was Boot - she was the youngest daughter of Jesse Boot, the founder of Boots the Chemist. Isn't it amazing what we can find out if we only look? At the beginning of the month I questioned whether the 1939 Register for Northern Ireland had been used after 1951, as none of the updates on the one page I'd seen gave a later date. As you'll know from the article above, in England &Wales the registers became the NHS Central Register, and continued to be updated - in some rare cases until the records were finally computerised around 1990/91. 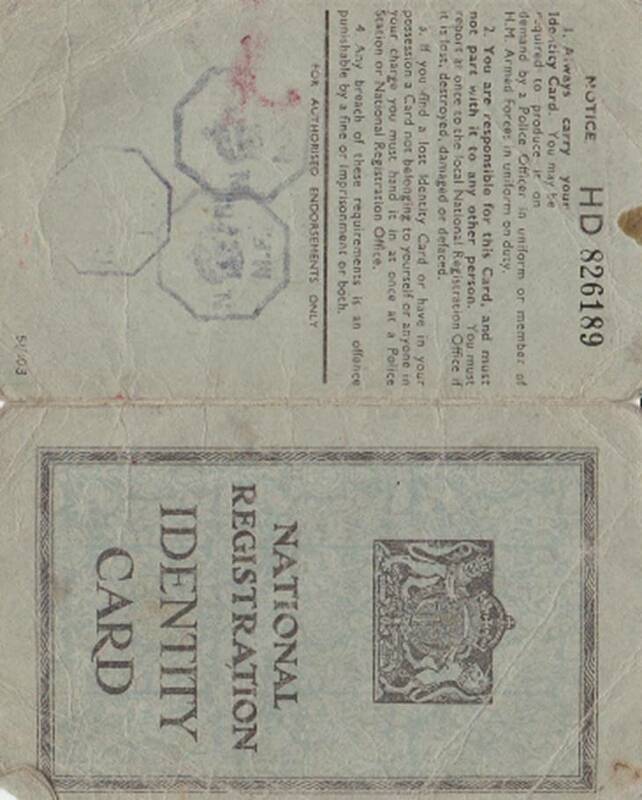 I have now had confirmation from the Public Record Office for Northern Ireland that, unlike the registers for England & Wales - which continued to be used and updated after identity cards were formally abolished in February 1952 - the Northern Ireland registers were not updated after identity cards were abolished. Since that original article I've had emails from several members who have successfully obtained copies of register entries for members of their family. A regular correspondent recently reminded me that it's 4 years since I last mentioned the Irish Army Census of 1922, which is online here, at the free MilitaryArchives.ie website. Other resources at the site include the Military Service Pensions Collection - it's well worth a look if you have relatives who took part in the fight for independence. 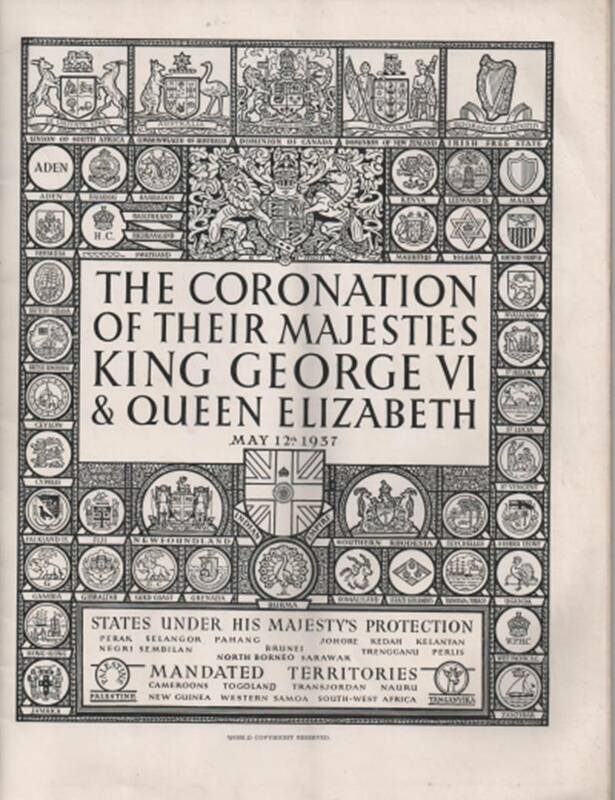 The Irish Free State was established under the Anglo-Irish agreement of December 1921, but according to Wikipedia it was a Dominion of the British Empire until 1931. 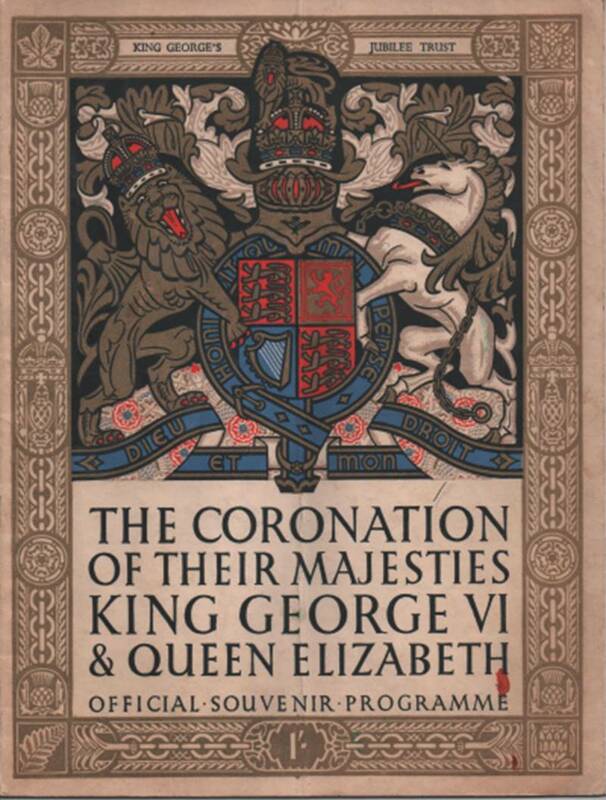 I was therefore quite surprised when I acquired a programme for the Coronation of King George VI in 1937 to see that the Irish Free State was still being shown as one of the countries where has was Head of State (see the top right of the black and white engraving). Yet another serendipitous discovery! Looking elsewhere on Wikipedia I discovered that it was only in 1949 that Ireland formally left the British Commonwealth (as it had by then become) in 1949. I've been hearing whispers about Wiltshire records going online at Ancestry, so I decided to ask Wiltshire and Swindon Archives whether there is any truth in the rumours. There certainly is - I discovered that it is hoped that the parish registers will be online in the summer, and wills later in the year, which is great news for anyone with ancestors from the county. Tip: if you can't wait, there is an online index to wills here. 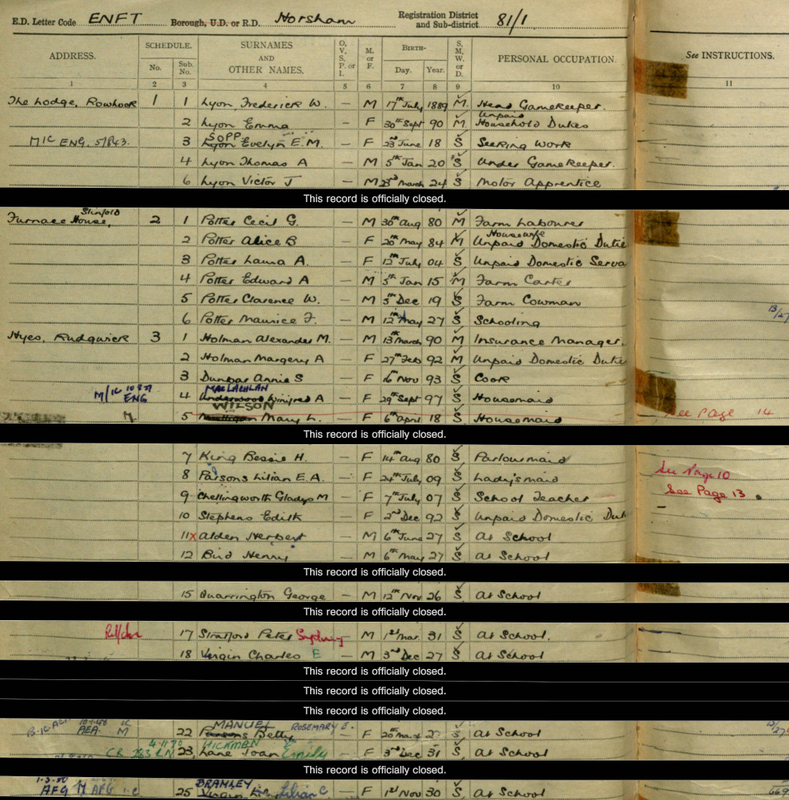 On the day my last newsletter was published Ancestry launched a new record collection with over 100,000 records of convicts held in prisons in Swansea and the surrounding area - you'll find it here. I don't have any Welsh ancestry - to the best of my knowledge - but my wife is three-quarters Welsh, so who knows what black sheep I'll discover? Talking of which, the only time I've ever seen black sheep was in Wales. Black fleece is caused by a recessive genetic trait (see my recent articles about cousin marriages if you want to know more) so it's quite possible for two white sheep to produce black offspring. I've heard from several members that the PDFs they ordered were delivered in 24-48 hours, which is an impressive turnaround time - however it also suggests that demand is lower in phase 3 than it was in phase 1, possibly because the price differential is smaller (a PDF costs £8 compared to £9.25 for a certificate). Nevertheless, for researchers outside the UK, especially in Australia or New Zealand, the opportunity to obtain copies of register entries within days, rather than weeks, is clearly appealing (and, whilst it might not come into the GRO's calculations, the amount of postage they save is commensurately higher). There are restrictions on ordering recent certificates - you will be expected to provide much more information if the entry relates to someone who is, or might be, still living. Just over 5% of the records held by the National Archives are available online, which might not sound a lot, but they include many of the records of most interest to family historians. Some you'll already have access to as part of your subscriptions to Ancestry, Findmypast, or The Genealogist - but others are only available at the TNA website. There are 66 research guides available which describe the different online record sets - you'll find them here. Recently I was re-reading the newsletter I wrote in April 2005, just before the 1st birthday of LostCousins, when I came across an article about Collect Britain, a website operated by the British Library which had an amazing collection of accents and dialects from all over England. Inevitably the link no longer worked, but the collection still exists and can be found here. At the same website you'll find other sound recordings - the voice of Florence Nightingale was, sadly, difficult to make out, but Jack Hobbs*, one of the greatest batsmen in the history of cricket, comes over beautifully. Both of those are in the "Early spoken word recordings" section, but the best of all comes in the "Berliner Lautarchiv British & Commonwealth recordings" section, which has hundreds of examples of British prisoners-of-war who recorded readings during the Great War. * I took my late father to a charity cricket match around 2001, and (with some prompting from me) he got the autograph of Nasser Hussain, then England captain. I was fascinated to discover during the ensuing conversation that the last time my father had obtained a cricketer's autograph it was from Jack Hobbs, around 70 years previously. The day after the last newsletter was published I discovered Ancestry's plans for a new 'Genetic Communities' feature that will extract additional information from our DNA in order to tell us more about where our ancestors came from or rather, where they might have been a few hundred years ago. Readers in Ireland might have seen the Late Late Show on Friday 17th March which featured Mike Mulligan of Ancestry Ireland revealing the genetic background of four Irish celebrities (at least, they thought they were Irish!). It's available online here and seems to be viewable anywhere in the world. On 28th March Ancestry began updating the records of people who have already tested with them to reflect the communities they have been linked with - so far my brother (the only family member who tested with Ancestry) has been linked with the Southern English community, and indeed most of our known ancestors came from that area. You can find out more about the new feature in this post on the Ancestry blog. The bad news is that Ancestry have discontinued TreeSync®, the technology which syncs Family Tree Maker trees with Ancestry online trees; the good news is that it has been replaced by FamilySync, developed by Software MacKiev, the new owners of the Family Tree Maker software. However, FamilySync will only work with Family Tree Maker 2017, which is due for release at the end of this month. According to the announcement anyone who has purchased Family Tree Maker from Software MacKiev will receive a free update over email; if you purchased an earlier version you can upgrade at a concessionary price (which may be slightly cheaper if you place your order before the release of the 2017 edition). Above all, owners of Family Tree Maker who haven't registered with Software MacKiev should do so right away! My wife pointed out an interesting article on the BBC website about entries in Hampshire parish registers which appear to have been created by the author, Jane Austen, when she was a teenager. Her father was the rector of the parish, so this may have provided Jane with the opportunity to make the entries - which don't appear in the body of the register, but in the printed examples at the beginning. Despite this vandalism Jane Austen became a successful author. But should we really be encouraging this sort of behaviour by putting her portrait on the new plastic £10 notes? The latest genealogical mystery from Nathan Dylan Goodwin is described as a novella, but don't let that diminutive put you off - I found it just as rewarding as any of the novels in this excellent series. Chapter 1 begins the morning after Morton Farrier has flown into Boston's Logan International Airport with his new wife. They’re on their honeymoon, but Juliette (who I sometimes feel knows Morton even better than I do) has encouraged him to spend the first two weeks in Massachusetts searching for his biological father, a quest that has until now taken second place to his work as a professional genealogist (it seems ages since he first discovered that his aunt was really his biological mother). As ever the author has thoroughly researched the story - travelling out to Boston, and visiting the same archives and record offices that Morton uses; he even dined in the same restaurants. Indeed, I suspect he wrote the opening pages when he himself was suffering from jet-lag (method writing?) since he has Morton miscalculate the time difference between New England and Olde England. I mean in hours, by the way, not centuries. 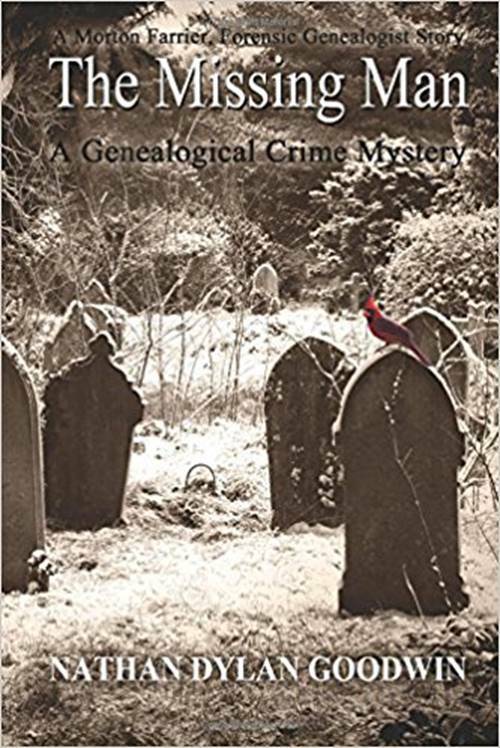 One of the hallmarks of genealogical mystery novels is the way that they weave together multiple threads and this book is no exception, cleverly skipping across the generations - and there's also a pleasing symmetry that helps to endear us to one of the key characters. Plus there's an additional surprise at the end - one that will, I suspect, have quite an enduring impact on the Farrier household. If you've read the other books in this series you won't need me to tell you to rush out and buy this one - but if you haven't, why not read them in order for the ultimate experience? I suspect that like me you'll have a soft spot for Morton and his Juliette! You'll find links to the earlier Morton Farrier books here. Many family historians with an interest in DNA testing will have encountered Blaine Bettinger's blog, and his latest book - The Family Tree Guide to DNA Testing and Genetic Genealogy - is an amazingly comprehensive work that covers almost every aspect of DNA testing, not just the nuts and bolts of how DNA is inherited, and what the various tests can tell us, but also aspects that we all need to consider, such as privacy and ethics. For example, what should we do or say when we find out something that undermines someone else's beliefs about who they are? As inquisitive researchers we might be over the moon when we make a discovery which proves that the father shown on a birth certificate can't, in fact, be the genetic parent of the child - but that doesn't mean that we should tell everyone what we've uncovered. Blaine Bettinger started writing about DNA testing and genetic genealogy in 2007 - the same year that my first articles on the topic appeared in this newsletter - but he took his first DNA test way back in 2003. In those early days the focus was on Y-DNA and mtDNA testing - autosomal testing as we know it today didn't exist - and many of the companies offering DNA tests (there were a lot of them of them in those days) oversold the concept. For many years I was warning readers of this newsletter not to waste their money on DNA tests! How things have changed - prices have fallen significantly, but more importantly everyone, male or female, can take autosomal tests such as those offered by Ancestry DNA, 23andMe, and Family Tree DNA (who use the name Family Finder to distinguish their atDNA test from the Y-DNA and mtDNA tests that they still offer). And yet, many people - including quite a few of those reading this newsletter - still believe that only males can test! This just one of 11 common misconceptions that Blaine Bettinger gets out of the way in Chapter 2 of his book. Chapters 4, 5, 6 and 7 deal successively with mtDNA, Y-DNA, atDNA and X-DNA - explaining how each type of DNA is inherited (they're all different), and what we may be able to learn from the respective tests. Readers of this newsletter ought to know most of it, but experience tells me that much of what I write gets skipped over or forgotten, so having it all conveniently set out in one book will be extremely useful to many of you. The book is littered with examples, but I didn't find all of them as useful as they might have been because, like many of you, I don't have parents, grandparents, aunts or uncles who can provide samples. Nor can I understand why anyone with both parents still living would want to take a test themselves since, barring a handful of mutations, all of our DNA comes from our parents - any cousin whose DNA matches ours will also match one or other of our parents (and, very occasionally, both). Most of us who have already tested our autosomal DNA will know that the challenge is not finding DNA cousins - all three of the major testing companies will produce hundreds or thousands of matches - but figuring out how on earth we're related to them, given that very often the common ancestors won't appear in the tree of either party. Blaine Bettinger explains (in Chapters 6 & 10) how shared matches, chromosome browsers, and triangulation can point us in the right direction, but there's still scope for someone to write a follow-up book (or, perhaps, a few newsletter articles?) with alternative strategies that befuddled researchers can use to help identify which parts of their tree are shared with their DNA cousins. Indeed, since the book went to press last year there have been at least two important developments: Living DNA are using data collected for the People of the British Isles project to break down British Isles ancestry into 21 areas, and more recently Ancestry have revealed their upcoming DNA Communities feature, which will apply to both past and future tests. The penultimate chapter looks at the challenges faced by adoptees who are seeking to find their birth family using DNA, and the author makes the interesting point that adoptees are, like all of us, up against a 'brick wall' - it’s just that their 'brick wall' is much more recent. I've been surprised that, when I've been approached by members who were adopted, they often seem to think that DNA testing can't help them - when in reality DNA testing is usually their best, and possibly their only, hope of finding the answers. Finally Chapter 12 looks at The Future of Genetic Genealogy, including affordable whole genome testing - something that we all hope to see one day! One strange omission - nowhere is the term centiMorgan (usually abbreviated as cM) defined, even though it's used throughout the discussion of autosomal DNA. Tip: if you want to know what a centiMorgan is, you'll find an excellent definition here in the ISOGG wiki. 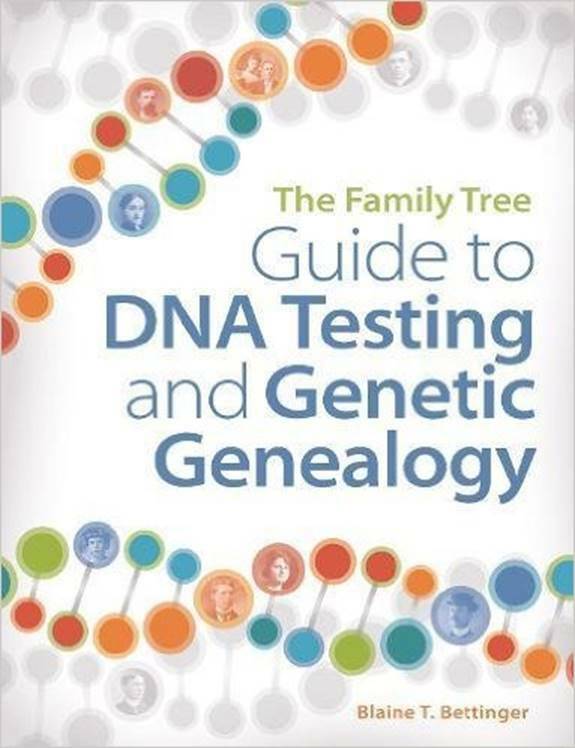 No book is every going to tell you everything you want to know about DNA testing, but with The Family Tree Guide to DNA Testing and Genetic Genealogy Blaine Bettinger has done an excellent job of bringing together the core facts and explaining the key techniques. It always amazes me how many people are prepared to spend out on DNA tests without really understanding what they're buying! I'm just coming to the end of The Butcher, the Baker, the Candlestick-Maker: The story of Britain through its census, since 1801 and will be reviewing it in the next issue. It takes an interesting approach, looking at the events leading up to the first modern censuses, and looking at events since then through the lens of census data. In the meantime I'm reading Simon Fowler's incredibly detailed Tracing Your Army Ancestors, which is now in its 3rd edition (the first two editions came out in 2006 and 2013). It's not light reading, but if it was I probably wouldn't be reading it at all - it's a really complex topic and it deserves the detailed treatment that the author affords it. In the April 2005 newsletter I mentioned earlier there was another article which caught my eye - it was the first time I recommended Irfanview, the free graphics program that does lots of things that family historians find useful. Let me first make it clear that I am completely useless when it comes to art and design - that's not how I use Irfanview. Instead I use it to carry out simple straightforward tasks that make my life easier, or which save me time and/or money. For example, I use Irfanview when I'm writing this newsletter, to cut out the parts of images that I want to include, and leave the rest behind; in the process I might also change the brightness or the contrast so that it stands better, or reduce the size so that it doesn't take up too much space. You can also use it to reduce the size of photographs before you email them to friends and relatives. I often use it to avoid wasting ink when I'm printing out a census, or a page from a parish register - there's nothing worse than wasting ink on big areas of black nothingness that I didn't want in the first place! This article from a year ago shows how one LostCousins member come up with a really ingenious way of saving ink when he's printing out the 1939 Register. I've changed the defaults on my PC so that files I download from Ancestry and Findmypast open in Irfanview when I click the filename - this enables me to crop it, if necessary, then change the name of the file to something sensible and save it in the appropriate folder (I have a folder on my computer for each of my ancestral surnames - it's a simple system, but it works well). Of course, there are often other ways of doing the same things, if you know how, but for the average family historian Irfanview is as good as it gets. A reminder that if you're a UK taxpayer you've got less than a week to use your 2016/17 ISA allowance - although now that the first £1000 of savings income is tax-free for standard rate taxpayers, and interest rates are so low, the attraction of ISAs has reduced considerably (I'm looking forward to the day when the long-awaited Innovative Finance ISA finally becomes a reality). The publicity given to the recent rise in inflation demonstrated once again how statistics can be mangled by the media - even the BBC gets it wrong from time to time. Price did not "go up 2.3%" in February - they were 2.3% higher than the year before, which isn't the same thing at all (indeed there are occasions when the monthly movement and the annual movement are in opposite directions). In the next issue I'll be taking a further look at the 1939 Register - see you again soon!